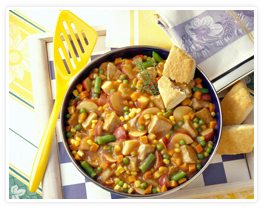 In large skillet, brown pork cubes; stir in gravy, ketchup and potatoes; cover and simmer for 10 minutes. 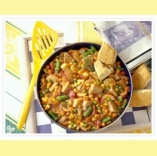 Stir in vegetables; cook for 10-15 minutes longer, until vegetables are tender. Whisk all ingredients (except the greens) together in a small bowl. Thin if necessary with additional buttermilk. Taste and adjust the seasoning. Use immediately or cover and refrigerate. Toss mixed greens with the dressing and serve immediately.